Probably not a lot of people have heard of this film, but hopefully now with the DVD format it can get the audience it deserves. "Time and Tide" opened in the year 2000 in it's native China and has been a favorite at a few film festivals during the past few months. The movie eventually opened in the United States during May 2001 with limited release courtesy of Tri-Star. I read some really good reviews, saw some clips of the movie and saw the trailer. Thoughts in my mind began to form as it really looked like one cool movie that I really wanted to see. Unfourtantly, I didn't get a chance to see it in theaters, which was why I was really eager to check out its debut on DVD. So within three months of the U.S. debut in cinemas, Columbia/Tri-Star brings it home which I found really impressive. The sooner the better, right? I think so... but what is this movie about and what makes it what it is? Let's see, shall we? "Time and Tide" follows Tyler (Nicholas Tse), a young man who is facing fatherhood and needs some money... fast. So he becomes a bodyguard. However, soon Tyler is faced in an impending battle when he meets someone as their lives do parallel in certain ways. Why they have to work together to stop an assination, they are slowly put against each other leading to an incredible confrontation. The movie is a bit... interesting. I personally found the story a bit confusing and murky in a few areas, but what you have in this plot may seem like an obvious excuse for some incredible action sequences, stunts and marvelous visual style. That's not true, to my surprise. Despite the well-recieved reviews I read, this movie actually has a really good plot that's developed nicely (even though at times I had a little trouble following it), moves along at a good pace and is really, really developed well for an action movie. Some of the stuff here may seem a bit far fetched, but the way things are pulled off I found it to be pretty believable. There is some really good character development here and really tight and intense conflicts that make things work so well. If you think you're going to see this movie just for a stupid plot and a load of great action, you won't get that. Yes you'll get that great action which can be really amazing at times, but you'll get a pretty well made story with great lines, great dialogue and a lot of thought behind it that makes it like nothing you've ever seen before. Director Tsui Hark and writer Koan Hui really hone a good story and good characters in all of this, and it's really worth it to watch this movie a few times to get everything and the whole story... as I said, I was a little confused at times with what was exactly going on, and it really seems a movie like this was made for repeat viewings. But not just for the story, but for the action as well. If you love great action, violence and stunts then you'll want to relive some of these sequences over and over, they're pretty damn incredible. They're some of the best I've seen in a long time in cinema, and all of them work are the perfect lengths. This movie is cool and definently enjoyable at that level, and some of the stuff pulled off here is pretty amazing. The gunfights, the chases... just a whole lot of stuff (and the 5.1 to make it even better! more on that later). Action is a big part of this movie, and unlike some movies where high production values tend to overshadow the story, they go perfect hand-in-hand. The acting in this movie is also very good, and makes it all the more believable as well.The actors do a very good job with their roles, and always seem to take them to the next level which is always a great thing. Nicholas Tse does stand out here and does a great job with Tyler. Still, I felt the real star of the movie was Tsui Hark's incredible direction, it's really impressive. His style is really remarkable as he captures so many great angles, great close-ups and nice wide shots that stream with creativity. The way he moves and manipulates the camera gives this movie a great edge, it reminded me a bit of a music video. You just have to see his style to really understand what I'm talking about. He sets the film at a great pace and all of his "experementation" works wonderfully. Top this off with great editing, quick cuts and a great flow and you got yourself a true visionary. With an interesting premise good acting, fun action and as I mentioned, great directing, "Time and Tide" is worth your time. Check it out! "Time and Tide" looks pretty stunning and but the amount of really noticeable grain on the image is distracting and annoying. The movie is presented in 2.35:1 anamorphic widescreen and it really captures the movie's unique editing style and wonderful visuals. The variety of dark and bright colors are well saturated. My complaints are minimal: it can be a bit grainy as I mentioned which I found really tedious and an annoyance. Blemishes and pieces of dirt pop up here and there, but it's never really distracting. Despite this, it is one fantastic transfer and I was really, really pleased how it came out. One of Columbia/Tri-Star's better transfers out there. There are quite a few options with the audio. The film can be heard in an English dub that is in two channel sound or a Dolby Digital 5.1 mix, or the original Cantonese track in Dolby Digital 5.1 or two channel sound as well. There are English and French subtitles, not to mention English closed captioning. The subtitles represent what's being heard on the Cantonese tracks. The 5.1 mixes are very strng and pretty intense, as it is one of the most action packed mixes I've heard in a long while. This movie is an action movie, and as you might have guessed, there are a plentiful of surrounds to experience. The loud music, large amount of gunfire and explosions really immerse you in the film's sound field. There's so much action going on it's like a non-stop party. It's loud, it's booming and all of it is creatively mixed together to make you feel like you're there watching all of it. I at times thought I was getting shot at directly. Bullets flying by and everything... it's just insane. The action also comes in wild car rides, scream and rain... yes, rain. I felt like the rain was coming down on me at times. Fidelity is very good and there is no distortion to be found in sounds. Thankfully, dialogue is clear on both tracks and easy to hear, and the variety of sounds don't interfere with what is going on. Little sounds like doors closing, clapping, wind blowing and footsteps are very good too. Reference quality, if you ask me. I was surprised how good the Dolby Surround tracks sounded too! Some of you may also be wondering how the dub track is in case you're not a fan of reading subtitles. The voices aren't corny or cheesy at all, as they fit well with the characters and usually sound natural. The English script stays true to the Cantonese script, while words match the mouths decently. It looks pretty good most of the time actually, as it has a nice flow, but there are times where it doesn't match up exactly. So, a surprisingly good dub for those interested. The DVD isn't loaded, but I was very glad to find a Audio Commentary with Director/Producer/Co-Writer Tsui Hark included on the disc, especially in the short time this went from a few theaters to the home video market. This is a really nice track, and while his English is not the best, it's still pretty easy to understand. Hark talks about creating the movie, its themes and what he was exactly going for. He's pretty enthusiastic and really talkative. Though he's not always screen specific, he offers a lot on how things were accomplished, good production stories, characters and a lot of information to absorb. I was disappointed though to find out there were deleted and extended scenes he cut, and that those scenes are nowhere on this DVD. Drag. A very good track fans of the film should listen to. There are two Filmographies (Tsui Hark and Nicholas Tse), while you can find four Theatrical Trailers on the disc. "Time and Tide" is non-anamorphic letterbox and two channel sound, "Once Upon A Time In China" is in two channel sound as well (it's a video trailer), "Crouching Tiger, Hidden Dragon" is in full frame and two channel sound and "Miracles" is in full frame and two channel sound, that's a video trailer as well. 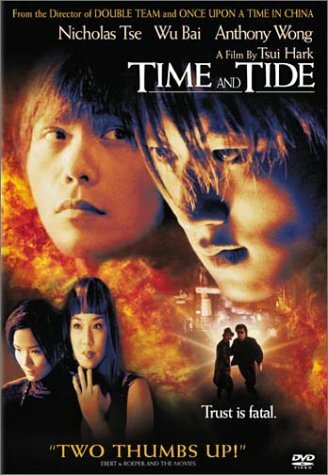 "Time and Tide" is quite an original movie, and while I'm not sure if everyone will get the plot completley, it's worth checking out for fans of foreign cinema and action fans. Great presentation and a commentary to top it off, be sure to check out "Time and Tide" on DVD.